Today is Father's Day and I'm spending a quiet day with my husband, Don. I haven't been fortunate enough to have a father to spoil on this day for over 32 years. Today is also a birthday of one of my grandsons. Connor the eldest son of my daughter is six years old today. Elisa sent me pictures of his pirate birthday party that he had yesterday. I'm sure she used the Ahoy, Matey stamp set for his party invitations. 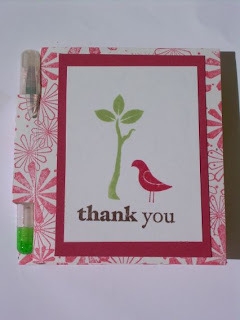 Today you can view the Stamping'Up retired list that was posted this morning. You have until August 8th to purchase any of the retired list. After that date they will be gone forever. There are a few sets that I'll really miss. The whimsical frog set Unfrogettable, Touch of Nature,Carte Postale and Peaceful Wishes. There are also two background stamps, Flannel Plaid and French Flair that have been very popular. The last set is a word and saying birthday set, It's Your Birthday.. I use this set a couple of times a week for birthday cards. So grab your catalog and look through the retired list to make sure you have what you want from the current catalog.